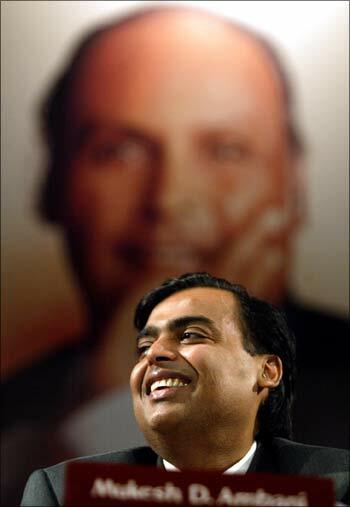 The Ambani brothers -- Mukesh and Anil -- came together for the inauguration of a memorial for the legendary industrialist and founder of Reliance Group Dhirubhai Ambani in Chorwad town in Junagarh district on Wednesday, in the presence of the entire family. It was after a long time that the Ambani siblings were seen together in the family reunion. 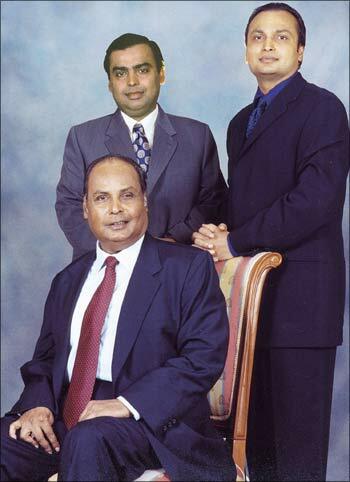 A few years after the death of their father Dhirubhai Ambani in July 2002, both the brothers had parted ways levelling allegations against each other. The memorial was inaugurated at the hands of the Ambanis' family guru Ramesh Oza (Bhaiji), where Kokilaben, her two sons Mukesh and Anil, two daughters -- Dipti Salgaonkar and Neena Kothari -- were present among others. 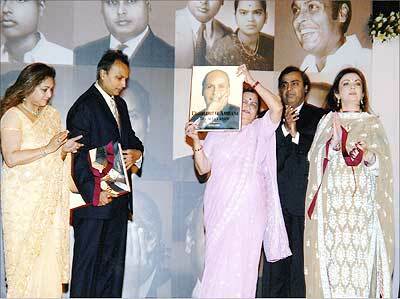 Image: (Left to right) Tina Ambani, Anil Ambani, Kokilaben Ambani, Mukesh Ambani, Nita Ambani at a function to mark the release of the book Dhirubhai Ambani: The Man I Knew, written by Kokilaben, in Mumbai in 2007. The family reunion in Chorwad took place after a hiatus of 15 years. The last one was in 1996, when Dhirubhai was present and a grand feast had been organised for the villagers, sources close to the Ambani family said. Talking to media persons, Group president of Reliance Parimal Nathwani said, "The entire Ambani family got emotional at the inauguration of the memorial, which is nothing less than a Bharat Ratna type of fitting tribute to the patriarch Dhirubhai Ambani." He said it was significant that a memorial in his name came up at a place, from where, Dhirubhai began his career as a young entrepreneur. The house in Chorwad, where Dhirubhai lived, till he left for Eden (now Yemen), is transformed into a memorial. A memorial in the name of an industrialist is unheard in this part of country, Nathwani said. "The spiritual guru Ramesh Oza will also deliver a one hour discourse, which shall be attended by the Ambani family," he said. Nathwani said, that Ambani family took part in havan (ritual) on Tuesday and the reunion culminated with raas garba played at the Chorwadi temple premises. "This was completely a family function and therefore no friends were invited," he added. The Ambani family, which had converged in their home town for the inauguration of a memorial of their father Dhirubhai on his 80th birth anniversary, is expected to depart later in the day. The Dhirubhai Ambani Memorial is the same place, where the founder of Reliance Group spent his childhood. A rented section of the bungalow, then called 'Mangarolwalo Delo', was the place where he lived. 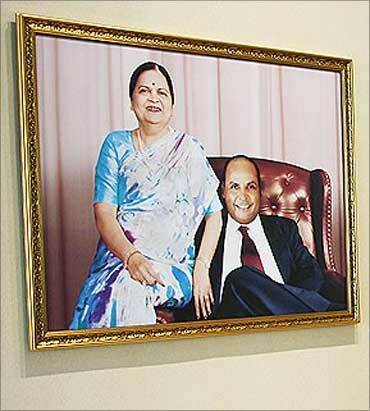 Dhirubhai had purchased the bungalow in 2002 which is now renamed as 'Dhirubhaino Delo'. The memorial has three sections -- a pictorial gallery, the old residence of Dhirubhai and an auditorium. The sepia gallery depicts Dhirubhai's journey through pictures, while his old dwelling is arranged the way it was and the auditorium is for screening a short film on his distinguished life. 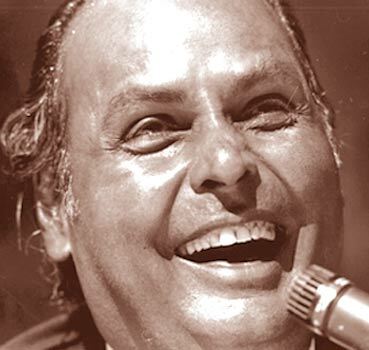 After the death of Dhirubhai Ambani in July 2002, both the brothers had levelled allegations against each other. 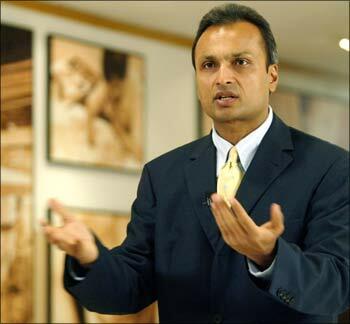 In 2006, a formal split took place, with Mukesh taking control of flagship Reliance Industries, with interests in petrochemicals, oil and gas exploration, refining and textiles, while Anil took control of the telecom, power, entertainment and financial services. Want to invest wise and be rich? Read this!